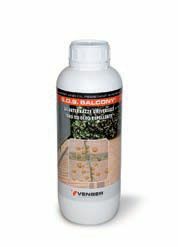 Water and oil resistant solvent-based protecting product with quick drying for microcracked floors of alconies and terraces. It neither creates surface films, nor modifies the substrate in a permanent way. Stronger and more lasting than silloxanic products. It is stain and oil resistant, one component, single-coat product.